Current monitoring of connected devices and automatic shutdown of the hub and error reporting to the operating system in case of overcurrent. Additional thermal monitoring and safety fuse to prevent damage to motherboard and connected devices. Power can by supplied to the hub either via USB connection to the motherboard or via SATA power connector. 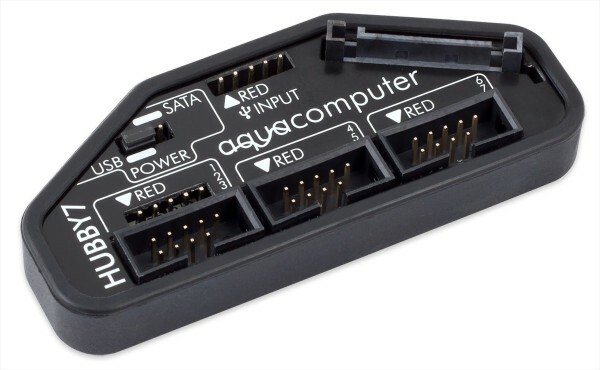 If power is supplied via USB, depending on motherboard configuration, power will also be supplied during standby of the PC, therefore enabling connected devices (keyboard, aquaero) to trigger system startup. When using USB power supply, a maximum current of 500 mA is available for the hub and all connected devices in total. If power is supplied directly from the PSU via SATA power connector, no power is supplied during standby, which might for example be beneficial to disable computer mice with annoying light emmisions during standby. When using SATA power supply, a total current of 1000 mA is avaailable, split up to a total of 500 mA for ports 1, 2 and 3 combined and ports 4, 5, 6 and 7 combined. The hub can be installed raised by 20 mm above the motherboard, the hub is equipped with suitable mounting holes distanced according to ATX specification, spacers and screws are supplied with the hub. Alternatively, the hub can be installed using a self-adhesive hook-and-loop fastening strip also supplied with the hub. Notice: Because of current limiting features, the hub is not suitable for USB-powered hard drives, CD-ROM drives, mobile phones and similar devices. Kann ich damit den Aqualis xt, Flow 200, und Aquastream xt an ein int USB anschliessen und per Aquasuite Software steuern ? Ja, das geht ohne Probleme. Laut Hersteller arbeitet HUBBY7 wie ein normaler USB-Hub und erweitert die Anzahl der USB-Anschlüsse. Ho collegato l'HUBBY7 alla scheda madre come indicato sul libretto, optando per l'alimentazione SATA (spostando ovviamente il cappuccio dell'hub sull'indicatore apposito) ma quando ho provato ad accedere il pc non si è acceso, come mai ? ho letto su internet che quando ciò avviene probabilmente si tratta di cortocircuito della scheda madre. does it work if you don't plug in the hubby? Has anything been connected to Hubby itself yet? If yes, then you can try the hubby without any other connected devices. As soon as I disconnected Hubby7, the PC left (although with the blue screen), I honestly did not try to connect anymore, because I was afraid of damaging the motherboard.